Blogging - Why do someone blog? Is it really necessary? Is that a means to show off? These sort of inquisitiveness and disparage sometimes pricks the zeal of a blogger. This little space is like my fourth kid I would say :) who never complains even when I ignore it. Cooking and taking pictures of what I make is my passion and I love what I am doing. I strongly believe that it might have benefited someone in some way. For me it’s a way to keep my recipes organized and inspire myself to look at the collection and cook them again. I love to share the successful recipes with you all, so that I am not just cooking it for myself but if anyone can benefit from this, I am more than happy to do so. Baking always stir up the fervor; let it be savory dish or sweet decadent desserts. Quinoa is a staple in my pantry for last couple of years and I love to experiment with these tiny pearls which are packed with lots of goodness. 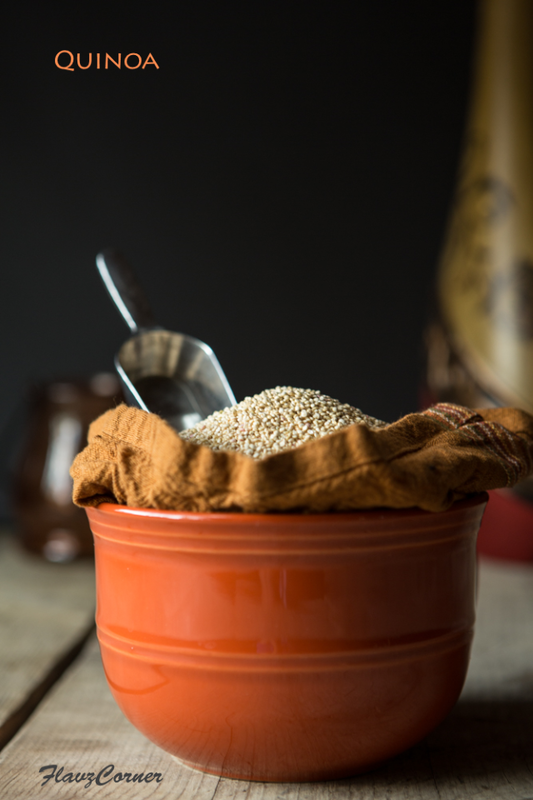 Quinoa contains antioxidant phytonutrients and flavonoids which are anti-inflammatory. It has a higher fat content that provides heart healthy mono saturated fat when compared to wheat. It is a best source of vegetarian protein. Quinoa is a very good source of manganese. 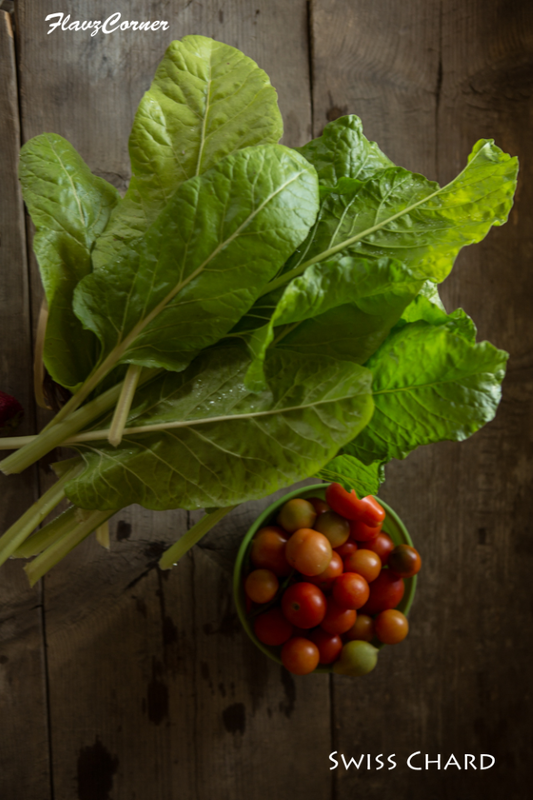 It is also a good source of phosphorus, copper, magnesium, dietary fiber, folate, and zinc. This recipe was developed when I was pondering to make an appetizer with some leftover cooked quinoa and some veggies those were sitting in my refrigerator for long. I make these Quinoa veggie balls and serves as a snack. You can serve this as an appetizer for parties. I usually make a big batch and freeze them and warm them up in microwave or bake it in the oven to fix a quick after school snack. In a non stick pan roast the chopped garlic in 1 tsp of oil. Add chopped onions with salt and cook till golden brown. Now add the chopped veggies, mix well. Add the rolled oats, quinoa, chipotle pepper and the sauces. Cover and cook for 1 minute. Turn of the burner. When the mix cools down little bit, add it to the potato mix and mix well. If needed add more chipotle sauce per your spice level. Adjust the salt. Add the chopped cilantro leaves and shredded cheese and mix well. 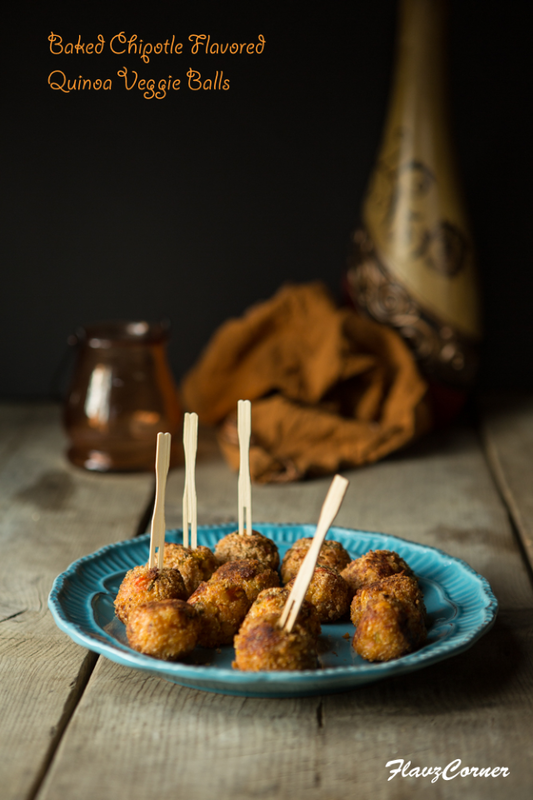 Make small balls (1 1/2 tbsp of mix for each ball) and roll them in seasoned bread crumbs. Heat 1 tbsp of oil in a wide frying pan. Place the balls gently into the pan, rotate the sides of the balls to get light brown color evenly on all sides. Its takes 5 -7 minutes. Pre-heat oven to 400 ° F.
Grease a baking sheet with cooking spray and place the balls on the baking sheet. Bake for 15 minutes or till golden brown. Set the oven to broil and bake for 5 more minutes to get the light brown color. 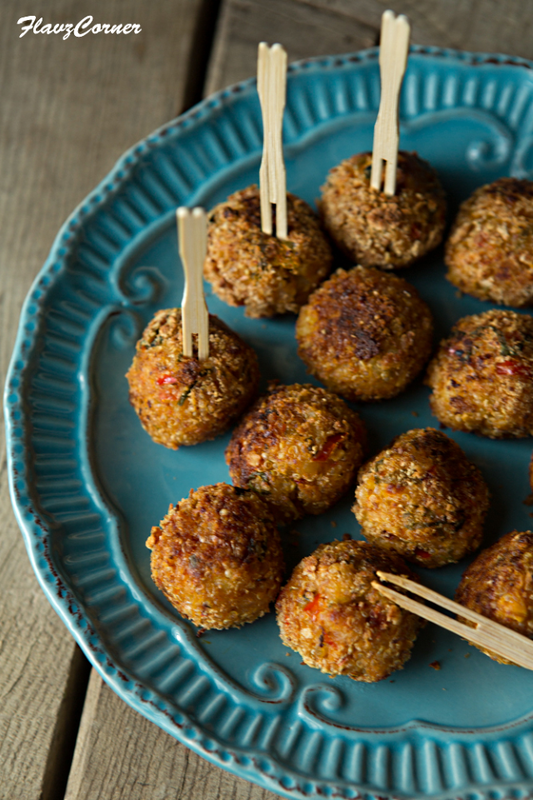 Enjoy the Quinoa Veggie balls while they are warm. You can serve them with ketchup or with your favorite dip. You can use any vegetable of your choice to make this snack. Make sure you grate or finely chop the vegetable for even cooking. Wash the quinoa thoroughly in cold water before cooking according to the packet direction to avoid the bitterness. You can increase the amount of cheese for more cheesy snack. Chipotle pepper is hot and the sauce gives the kick to the snack. Feel free to adjust the amount per your taste. It gives the smoky flavor which is the highlight of the snack. You can find it any grocery store on international/Mexican aisle. If you cannot find Chipotle pepper in Adobo sauce at your local grocery sauce, use chili flakes and Sriracha sauce to spice it up. You can either microwave for 20-30 seconds to warm up the snack or if frozen, pre-heat oven to 350 F and bake for 15- 20 minutes on a parchment paper or aluminum foil lined baking sheet. These quinoa balls look very delicious and so good for you too! Blogging is my notes others are welcome to read or not to read :) I too check my posts often for recipes.Yes, cooking is a skill so why not show off :)) Hey that said I went and bought a cast iron pan finally so u see someone is benefited. Those baked quinoa fritters look yum. Thanks Meena for the comments! Happy to hear that you got a cast iron pan. It is said that 'if treated them with proper care, they can be passed on to generations'. Keep it seasoned and take good care, its really worth it. I love my cast iron pans. Terrific way to use quinoa! Wonderful recipe, fun pictures -- thanks. lovely! wish I could take one out.. Thank you so much for trying the apple caramel cake Shibi. These little quinoa balls look and sound absolutely delicious. I love the recipe and I bet they are perfect for party appetizers too! These sound sooooo wonderful. Superb idea for party appetiser. YUM!!! These look mouthwatering!!! Love the potato combined with quinoa in the crispy bites!